After a long night full of exciting dreams, we are in urgent need of refreshment! 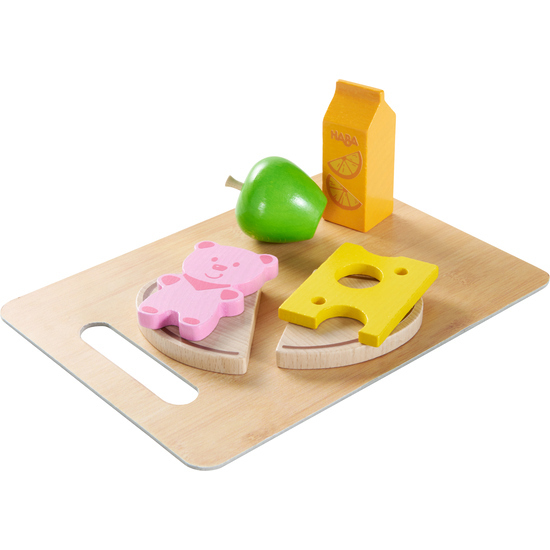 Ideal for this purpose is the HABA Good Morning Breakfast Set consisting of two slices of bread, an apple, a slice of cheese, sausage and a carton of fruit juice. The set is ideal for various role-playing games based around nutrition and breakfast. Contents: 2 x slices of bread, 1 x carton of fruit juice, 1 x apple, 1 x cheese slice, 1 x bear sausage, 1 x cutting board (made of cardstock).